Frustrated because that cupcake you ate went straight to your thighs but pastry seems to have no effect on the next guy? A new University of California Los Angeles study says you probably gained weight, and he didn't, because of a difference in your genes. While diet and exercise are still large factors in obesity, the degree to which one gains weight from a high-fat diet is largely determined by genetics, according to researchers. In the study, funded by the National Institute of Health and appearing in the print version of the journal Cell Metabolism, UCLA researchers gave more than 100 genetic strains of mice a normal diet for eight weeks, followed by a high-fat, high-sugar diet for another eight weeks. Even though the mice were eating the exact same diets, their weight gain varied greatly. The high-fat diet caused no change in body-fat percentage for some mice while others' body fat percentages increased by a whopping 600 percent. Those differences were largely attributed to genetics. The scientists identified and compared 11 genetic regions associated with obesity and fat gain in the mice, several of which overlap with genes linked to obesity in humans. The genetic differences translated into some mice being naturally more active and some being more effective at generating heat and thereby burning calories. "We've all seen those people who eat a lot and don't gain weight. Our results are entirely consistent with that notion," principal investigator Dr. Jake Lusis, a professor of medicine and human genetics and of microbiology, immunology and molecular genetics at the Geffen School of Medicine, told The Huffington Post. "It isn’t just all about how much we eat. Genes had a huge effect." While there have been numerous studies that have shown that obesity has high heritability, this is the first comprehensive study to examine whether response to a high-fat diet is genetic. 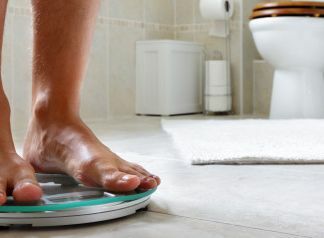 Still, the researchers emphasized that environmental factors such as diet and exercise are also important to weight gain. "If people consume a high-fat diet, the response will be predominantly determined by genetics," Dr. Lusis said. "But whether you choose to eat a high-fat diet in the first place is largely environmental." Dr. Brian Parks, study co-author and a postdoctoral researcher at the Geffen School of Medicine, told HuffPost that he hopes this and future research will lead to designing drugs and treatments that specifically target "fat genes." And while that kind of personalized medicine is at least five to 10 years away, doctors man soon be able to use imaging to visualize a patient's metabolism or "brown fat," which generates heat, Dr. Lusis said. In follow-up studies, the researchers hope to identify more "fat genes" and test the identified genes to understand how they're contributing to weight gain. The scientists also hope to understand the genetics of losing weight. "If we understand how genetic factors influenced so much of the population to become obese, we could potentially reverse it with more research," Dr. Parks said.